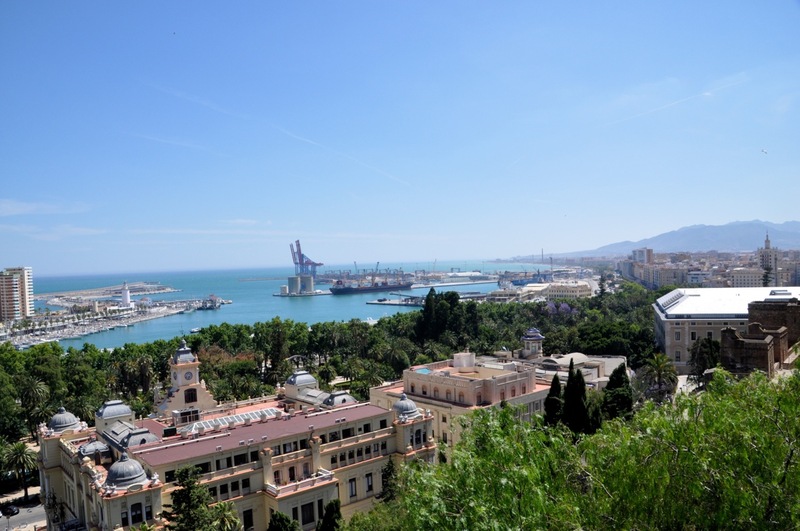 Málaga is a Mediterranean port city with about 3,000 years of history, starting with the Phoenicians in BC 800. Followed by the Carthaginians, followed by the Romans, followed by the Moors, and followed by the Christians. As you might imagine, there is history to see here; maybe not grand sights – Málaga is not on the tourist trail (not even mentioned in Rick Steve’s travel book) – but it does have some impressive sights, made even more enjoyable because it isn’t on the tourist trail (it’s real), and there are no crowds to fight. 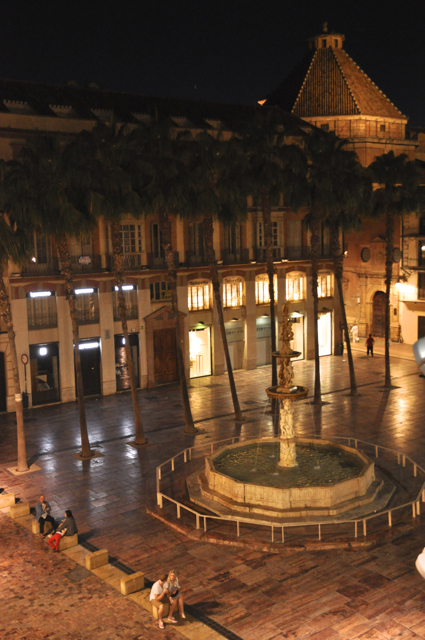 Before I show you around Málaga, let me entertain you with our first adventure. Málaga is also where the planes land if you’re going to the Costa del Sol, which is why we’re here – we’ve just arrived from the US, it’s the late afternoon, and we’re slightly stressed out. Stressed not only from lack of sleep, but just now concerned about our inexpensive hotel. 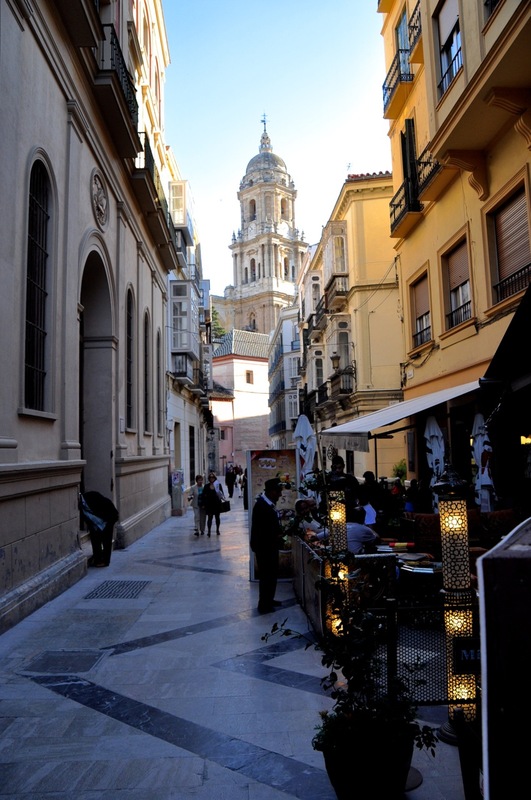 The streets are narrow in Málaga, and many streets can not accommodate cars – like, as we discover, our hotel street. The taxi stops in front of an intersecting alley, and informs us the hotel entrance opens into it – somewhere. It’s far enough up that we can’t see it. Oh yeah? Kind of an inauspicious start. Whatcha bet there’s no doorman either. We nervously shoulder our backpacks – all our belongs in this world – and start up this looong and narrow, darkish, not-quite deserted alley. Ginger is a little nervous. Glad it’s still daylight. Well, the room is not so bad. It’s clean and simple, and will do fine while we crash. First things first, I try to plug the computer into the Spanish outlet, and discovered that the really cool TUMI multi-prong all-of-Europe converter I bought is not grounded – meaning the converter has only two holes to plug a device into, and the Apple computer cord is three prong. Yeah, that’s a problem; why didn’t I notice that before? Stores are open until 9pm, so I go out to find some sort of converter, and to buy a phone for me and a SIM card for Ginger’s iPhone. Well, no luck with a converter, but a phone store said to come back the next day and all will be good. I think. Did I say that no one speaks English in the stores, and I learned my Spanish from a book? The next morning before check-out I hot-foot it to the phone store. The salesman opens Ginger’s iPhone to put in the SIM card, announces that it takes a “nano-SIM”, and that all of Spain does not have this for prepaid cards. Only for phones with contracts. (This info, of course, is in Spanish). OK, so I’ll buy a damn contract for a year. Problem solved. No, the contract can only be set up with a bank account where the money will be automatically withdrawn. Jeesh! So I’ll open a damn bank account and put in enough money for the contract. So I find a bank, which also doesn’t speak English. I learn I can’t open an account because I need an address in Spain to do this. So now I have to buy a house to get a SIM card!! Clearly this is spinning out of control and we need to find an Apple store. The hotel helps us, and we get the address – across town, of course. Well, surprise on surprise! The address is a department store! A big one, too. After wandering for awhile we find Apple – just an open floor space in the store – operated by a single person! Apple? There are two people ahead of us, and after waiting for an hour we successfully get a cord for the computer and, nearby, a phone store with the right nanocard (there is a company in Spain that does this). Good to go! In spite of the bumpy start, Málaga looked interesting; and so after a week in Costa del Sol we returned to Málaga for a few days. It’s delightful! It has a Roman amphitheater, a Moorish palace/fortress Alcazaba, a castle, a cathedral, and it’s where Pablo Picasso was born, with a museum devoted to his work (he personally donated much of the art). Okay, finally I’m going to show you around Málaga! Although it’s a city with a population north of half a million, at least in the downtown historical area it has all the feel of a much smaller place. Let me start by showing you, on the left, a typical view of one of Málaga’s streets. We’re just north of the central business district. Charming, yes? It’s not quite streets of gold, but did you notice that the street/sidewalk (too narrow for a car) is all marble? Beautiful marble? As are most of the streets/sidewalks of downtown. We’re impressed! For us, it’s the defining characteristic of this interesting city. Want to be more impressed? Let me show you the downtown main shopping street, daytime and nighttime. It’s so spectacular, it looks staged, doesn’t it? Airbrushed? Nope. I took those pictures. That’s the way it looks. Our hotel that we’re splurging on, by the way, is just off-camera to the right of that shopping street above. The picture to the left is a view of the adjacent small plaza from our bedroom window. And yes, the streets – and plazas – are all marble! The city has a lot of good, inexpensive restaurants like the one in the first picture below; their “berenjena con miel” (eggplant with honey) is by itself worth the trip to Málaga. 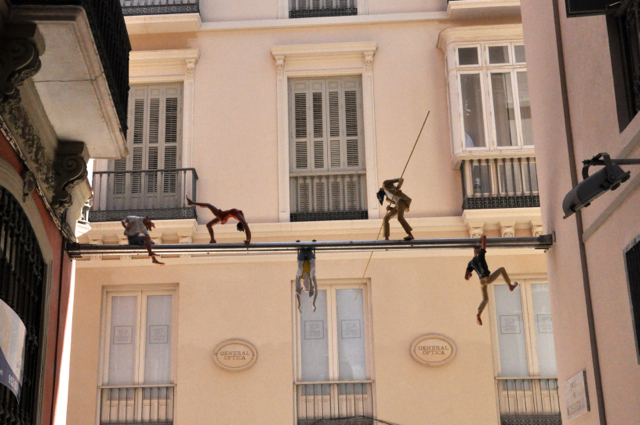 There is also a very entertaining street scene; the guy suspended in the air had me quite befuddled for awhile! The city also has a whimsical side, such as this art just hanging between buildings for no apparent reason. I mentioned the Picasso museum, which was quite enjoyable, but taking photos was not permitted. Most of the art was his early work, when he actually drew things that looked like what they really look like. He was indeed a talented artist in the conventional sense; one does not always know that from his famous ground-breaking art. I mentioned the Phoenicians earlier. 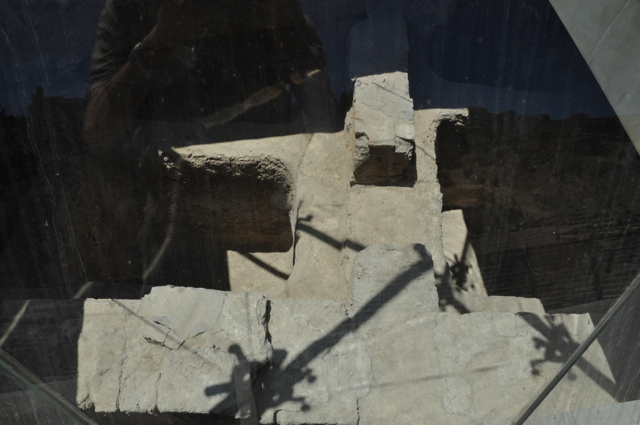 When the city digs a foundation for new buildings, they sometimes encounter old Phoenician walls and such, which are preserved; examples are shown below, discovered when the city was building the Picasso museum. right after the death of Julius Caesar. The fortress wall above the amphitheater in the left picture above belongs to the Moorish Alcazaba – we’ll get to that. The foreground in the right picture shows what remains of the amphitheater’s stage building. This impressive amphitheater is located right next to the shopping district, with no particular fanfare. Pretty cool. My apologies for this picture – too much contrast, too much reflection from the glass – but I thought it was cool. It’s close to the amphitheater, and shows 4 separate salting basins that the Romans used in the making of garum, a fish sauce made from a base of sardines and anchovies, and highly prized in the AD 300’s. There are a number of these in Málaga, usually residing in basements (unearthed when building foundations). I’d show you the the mosque from Moorish times, but when Málaga was reconquered by the Catholics in 1487, it was razed to build La Catedral de la Encarnación (you, citizen, are not Muslim anymore). Started in the early 1500’s, the cathedral was finished in the 1700’s. It is impressive, as shown below. Speaking of Catholics, we’re in our bedroom when we hear increasing noise – a parade! – just outside. Sure enough, a procession turns the corner and comes right past our window. A marching band is playing in the distance, lots of drums, and marching past are priests and people ambling slowly along. And then, rounding the corner, comes the church’s monstrance (Roman Catholic: large ornate piece containing the Heavenly Host). It is taking 100 mostly young men to carry it, slowly and very carefully; a human millipede. It does not look comfortable! For reasons unknown they stop right outside our window, and we get a great look. Then the band and they start up again, everybody perfectly in slow step, arms swinging in sync. Clearly if one person falls, bad things could happen, and this must be well-rehersed. Pretty cool! 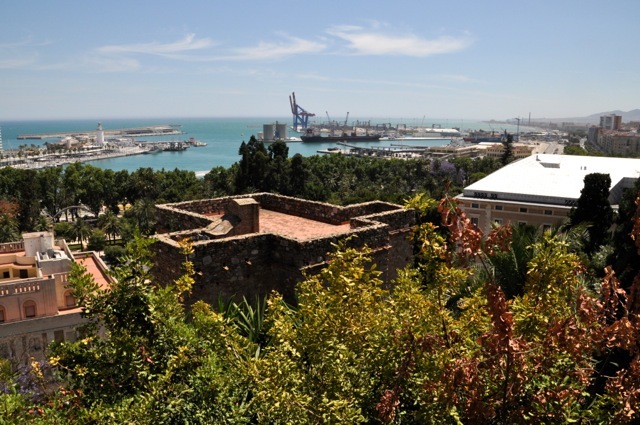 I’ve been saving the best for last – Málaga’s Alcazaba. It’s out of temporal sequence in this blog: it should have been presented before the Catholic cathedral. After conquering Spain in the early 700’s, the Moors ruled Málaga for nearly 800 years. The governor’s home, the Alcazaba, is part palace but mostly a fortress based on the best defensive theory of the day. In the first picture of the amphitheater above, you can see a section of its surrounding wall. Actually it has two concentric walls, as can be seen in the models below. If you wanted to attack, other than storming the fortress over the two walls (and uphill), you had to enter via the front door. To make that access difficult (in addition to uphill), the entry path consisted of long, exposed back-and-forth paths connected by tight enclosed 90º or 180º turns to restrict the number of people passing through at one time. And of course there are extensive vantage points to shoot down at the poor souls on the path. Please, Mr. Custer! We’ll walk up the paths so you can see this, as shown below. Well, after seeing the palace at Sevilla, this isn’t so impressive! Of course, Sevilla is an incredibly high bar to best. Although the “palace” here has Moorish arches and fragments of delicate plasterwork, it’s not well preserved, and it’s hard to visualize what was really here 600 years before the Catholic Reconquista. Even as it is, however, we could see living here in AD 1000 with a great view of the Mediterranean! 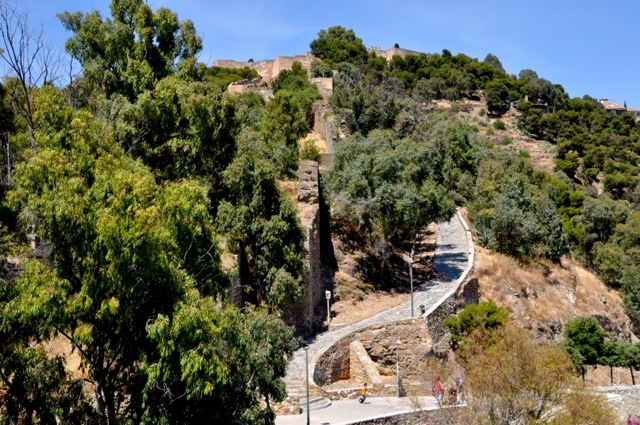 Although the fortress was designed to be impregnable, technology has a way of thwarting plans; the arrival of gunpowder and artillery needed a response, and so in the 1300’s a castle (Castillo de Gibralfaro) was built to defend the Alcazaba! Unfortunately we never made it there, although here is a picture of its walls from the Alcazaba. Well, hope you enjoyed this visit to Málaga, a delightful city off the tourist path. Next stop is the highlight of our Spanish trip – Cordoba. This entry was posted in Malaga, Spain.